Arthur Lee Samuel, Three First Names? Today I am standing on my soap box—because I’m too short for you to see me otherwise—and whispering, because if you want people to pay attention, you whisper. 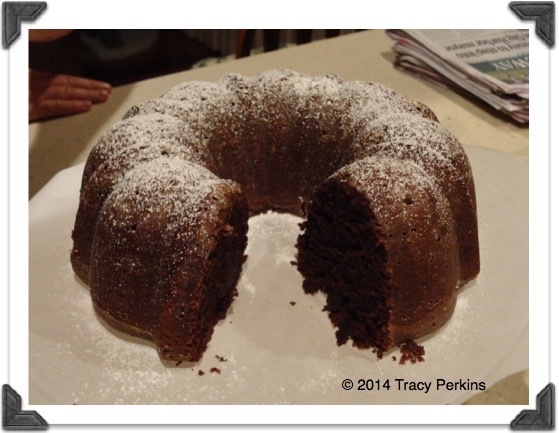 And have a slice of Chocolate Bourbon Cake. I understand it’s one of Dave’s fav’s. You might need to turn the volume up. Let the whispering oratory begin . . . I won’t stand for it anymore. There are consequences and they must be dealt with. Not since Arto wrote the notable Norbert Wiener post, postulating the Wiener Sausage, have I been this warmed up—except in August and it’s in the upper 90’s or low 100’s (Fahrenheit)—about a missed opportunity. In that case, to use the Wiener Sausage as a base for an episode of the Big Bang Theory. But that’s something else entirely. I’m talking about amending the funny names theorem, people. We need an amendment. I’m convinced that people having two or more first names as their full name should also be considered for funny name glory. Having two last names as your full name is a surefire way to be considered for funny names glory. Why not add The Arthur Lee Samuel Consequence? In case you don’t know Arthur Samuel, in 1959 he defined machine learning: A field of study that gives computers the ability to learn without being explicitly programmed. The consequences today are, of course, data mining. But that’s a different story. Arthur was born in 1901 in the fabulously named Emporia, Kansas. He graduated from the College of Emporia in 1923, leading him to the a master’s degree in electrical engineering from MIT in 1926. There are no photos in the public domain of Mr. Samuel. That being said, if you download AI Magazine’s Volume II Number 3 issue from 1990, a very lovely picture of Mr. Samuel awaits you. As does a comparison of Drosophila fruit flies and computer games. Just saying. Arthur created the Samuel Checkers-playing Program. It is credited as the world’s first self-learning program. Clearly Arthur was destined to pull the mathematical sword from the checkerboard. He worked his way through notable institutions such as Bell Laboratories, The University of Illinois (Go fighting Illini), IBM Poughkeepsie Laboratory, and Stanford University (I’m rooting for the Stanford Tree on this one because the color, Cardinal, throws me for a loop). Arthur was awarded the Computer Pioneer Award in 1987, landing him in the company of some wonderfully named companions. By the way, you have some cake crumbs on your shirt. Okay, you can turn the volume back down. *Unfortunately all three of his names could be considered last names leading back to the Baldwin Churchill Rule. (Ignore the conundrum behind the curtain—thus the consequence). This entry was posted in funny name theory, funny names in science, humor, humour and tagged bio, biography, funny, funny name, funny names, history. Bookmark the permalink. 25 Responses to Arthur Lee Samuel, Three First Names? How about three interchangeable names? Taylor Harry Fritz. Or is it Fritz Taylor Harry? Harry Fritz Taylor? It is the first one, could be the other two. He’s only the youngest person ranked in the top 100 male tennis players in the world. Now that’s a great name. I wonder how many people get the order wrong? As someone who has made (if I may be so bold) some modest contributions to the field, allow me to offer my imprimatur of approbation with regard to this brilliant and inspired noministic theoretical addendum. Artificial Intelligence or an era of political rhetoric. This month’s contribution to the BoFN. oh, how i yearn to be butter lampson. Isn’t it a great name. Yes, chocolate bourbon cake. Surely that would aid my hoarse, pollen-infested throat today. I do like this idea of three first names. In the immortal words of Canadian songstress Shania Twain, two don’t impress me much. But three, yes. I have never understood the middle name of Lee or even Lynn. They both seem the least creative of all middle names. Like you could not think of anything more bland or you were too tired to come up with a legit name. It is allowable if you are related to Robert E. Lee, I suppose. I am wondering if Harry Huskey met up with Manly Wellman because I think indubitably they could have forged a fire out of sticks and tinder or built some sort of shelter with their manliness. Samuel surely sports some Coke bottle glasses, no? Sorry to hear you are suffering from allergies. So funny about the Lee and Lynn being such bland names, it never occurred to me. Maybe because I had a thing for Lee Majors in the 70’s and Lee Meriwether did well with her career. I would have loved to see Harry Huskey meeting up with Manly Wellman. With that amount of manliness, they might not have needed sticks and tinder to light-up the fire. And Samuel’s glasses do certainly go with his image as a pioneer of the computer age. When I sport my imaginary geek glasses, that is what they will look like from now on. The photo reminded me of Burgess Meredith in the Twilight Zone episode “Time Enough at Last” where Meredith wears coke bottle glasses. I’d vote for that! And let [us] eat cake! Also, on a side note, “Fighting Illini” is by far the laziest name for a college mascot in the history of college mascots. lol about the “Fighting Illini”. I wonder if that means when they graduate they are the “Fighting Alumni”? Just a thought. And I still don’t get “Cardinal” the color . . . . I agree. Houston Texans, Philadelphia Phillies are two others. But they’re pro, so Fighting Illini can still be the laziest college mascot in history. I want to know if the Philidelphia Phillies should really have a sandwich for their mascot. It’s like baseball, hot dogs and a Philly. Move over Subway, I’m having a Philly. My better half was at a Milwaukee Brewers game last Friday. I’ll have to ask him about the sausage mascot. . .
Nice! My concern is that the sausages may not have been there if it wasn’t a Brewers’ home game, so he got to see Mariner Moose instead of the sausages! Wisconsin is a lot of fun. Haven’t made it as far as Door County yet. But Liz has raved as well as several of my friend their about it and I’m dying to go. Did the color run in Milwaukee a few years back. It was a blast, but between the heat, humidity and elevation (I very near sea level), I was grateful it was run at night. And we started and finished at Miller Stadium. They know how to tailgate in Milwaukee! Awesome stuff! And the Arthur Lee Samuel Coincidence is now an entry on the Funny Names Theory page! So much fun, Tracy! And love that the cake is still rocking it. You’ve written a good one here 🙂 Smiling that BoFN keeps on keeping on. Woot! And glad you’re back on the “air waves” with us.